MAS and I hiked to the top of Mt. Woodson today, via the East Approach trail, which is a steep but paved access road. On the way down, we met Greg who does bouldering, which is a type of rock climbing that doesn’t involve ropes. Here’s a link to my photo gallery. MAS’ used copy of Now, Discover Your Strengths was from me…. let me share my top 5 strengths. WOO – winning others over. You enjoy the challenge of meeting new people and getting them to like you. Strangers are rarely intimidating to you. On the contrary, strangers can be energizing. Context – You look back to understand the present….You realize what the initial intentions were. These blueprints or intentions have since become so embellished that they are almost recongnizable, but now this Context theme reveals them again. Communication – You like to explain, to describe, to host, to speak in public, and to write. Strategic – The Strategic theme enables you to sort through the clutter and find the best route. Individualization – While some search around for the perfect team “structure’ or “process,” you know instinctively that the secret to great teams is casting by individual strengths so that everyone can do a lot of what they do well. American Idol – Aussie Woohoo, Yeehoo! I have to admit that I’ve been sucked into watching American Idol this year… and I like it…and I’m supporting LaKisha for the winning spot. Anyway, if you happened watch tonight’s performance, you saw Gwen Stefani’s performing the song Sweet Escape. 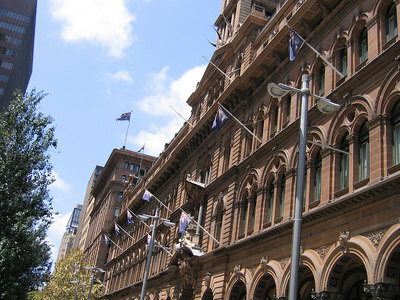 If you recall my blog on Oz Music, that’s one of the songs that I associate with Australia! 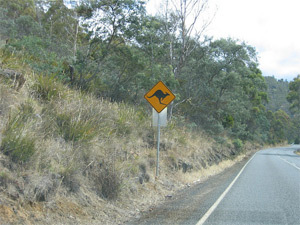 Picture it: driving on the right side of the car, windows down, summertime weather, driving in the middle of nowhere Tasmania singing along to Sweet Escape. And what an escape it was! There is an invasion of deadly jellyfish near where I visited in Australia. It shut down production of a major motion picture. Here’s a link. Thank goodness, my only encounter with a species of Australian jellyfish was of a far less toxic kind, the Bluebottle. Here is a link to my photo gallery of Manly Beach, which was closed to surfing and most swimming due to a lot of bluebottles. 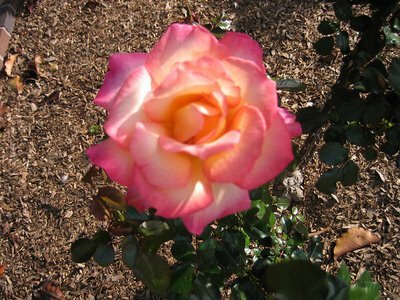 MAS and I went to the Rose Garden in Balboa Park the other day. I snapped a few photos, posted the new ones in a photo gallery. 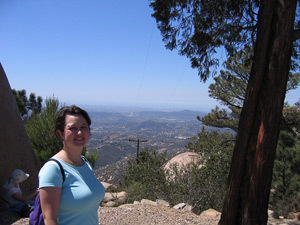 I am also re-releasing the original photos from the Easter 2002 photo gallery, now on smugmug. MAS and I went walking today in Downtown San Diego. 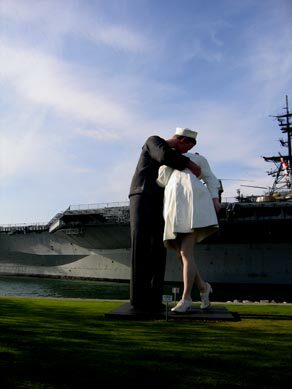 Near the Midway floating museum, there is a giant sculpture of a famous moment: the VJ Day kiss. 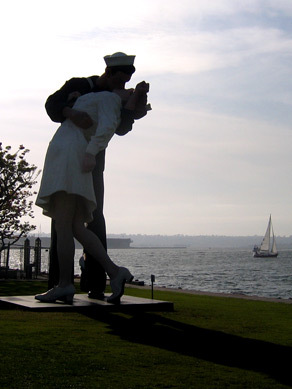 Here’s the wikipedia page on VJ day, which includes a bit on the story of the famous Life magazine photograph of Edith Cullen Shain and George Mendonça. Wen’t out to Anzo Borrego desert with Michael the other day. Part of this hike is a slot canyon. 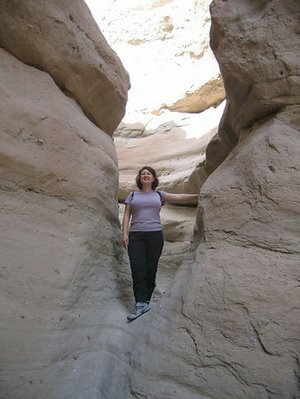 That was my second slot canyon hike. Here’s the photo of me. Here’s a link to MAS’s blog & gallery. My artwork has been published as part of an art school book for secondary school kids who are part of Marshall Cavendish schools, which appear to be International English-speaking schools. 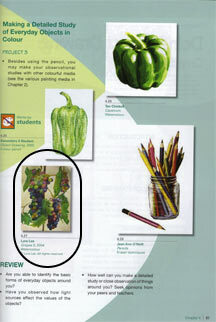 Here’s the image from page 51, where the Grapes 2 painting I did is featured. Are you able to identify the basic forms of everyday objects around you? Have you observed how light sources affect the values of objects? How well can you make a detailed study or close observation of things around you? Seek opinions from your peers and teachers. The .css file is new, and content has been updated. Some of the photos are borrowed from MAS’ site — we were at the locations together, but I haven’t gotten all of my photos organized yet. Blue… well, there isn’t much that is blue, which is new. Since there was a lot of color and a lot of blue in the last site. I went for minimalistic, clean design. Welcome to the redesign. Please wipe your feet. You are currently browsing the Lura.net Blog archives for March, 2007.